Megahouse's Portrait of Pirates figure range has reached such a level of popularity in Japan that each release sells out stupendously quickly. Specialist UK retailers like Neon Martian and Kamikaz-E try to import as many as they can, but sometimes they just aren't able to get them. We at Animetion are huge fans of the range and keep up-to-date with all of the forthcoming releases, marking off in our minds which figures we want the most. When this one was announced we knew we must have it, but due to its size and popularity we never expected any of the UK retailers to get hold of it. However, Neon Martian have surprised us before and they have done so once again! In the manga Edward 'Whitebeard' Newgate is the most powerful of pirates. He's Portgaz D Ace's direct superior and is a giant of a man, standing at three times the height of a normal person. In figure form he's one of the few Portrait of Pirates figures that isn't in scale against the others, but he is still the biggest one to date. The figure alone stands at a whopping 32cm (13") tall, and his halberd is around 45cm (18") long making the entire piece one of the most impressive and imposing figures Megahouse has made to date. 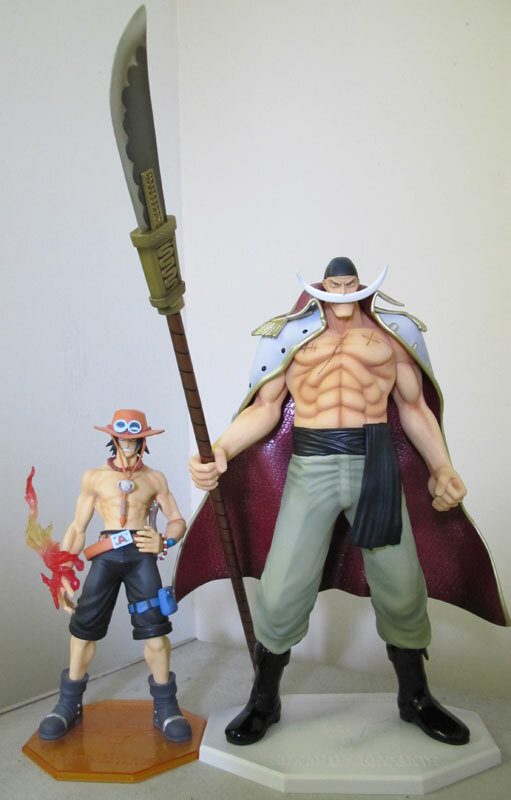 As with all Portrait of Pirates figures the Whitebeard figure comes fully painted and the only assembly required is to attach the pegs on the supplied base to the holes on his feet, rest his coat on his shoulders, slot the halberd pole through his hand and clip the blade on it. As always the pieces are all manufactured to perfection, and everything connects together firmly and neatly, with no noticeable gaps. With many recent Portrait of Pirates figures coming with additional faces, arms and loads of weaponry and accessories you would be forgiven for thinking that this figure is a little basic. With the exception of the coat and halberd there's no additional parts, and the figure stands in quite a straightforward pose. There's no energy pieces to put over his hands to depict his Devil Fruit powers either which could seem something of a surprising omission. But to these criticisms I can say one thing - Just LOOK at it. The picture's just there to the right of this paragraph. Click on it to see a bigger version, and click here to see a close up. I'll wait. Looks good doesn't it? painted with neat, clean lines. However, what is really impressive is the sculpt of his body. The musculature of his arms and torso is spot-on, with perfect shading making the design work really stand out, and the fine detail of his old battle scars and even the veins on his arms is picked out with impressive accuracy. The lining of his coat is textured and the battle damage to the alternative halberd blade is both well done and nicely subtle. In fact the only thing that stands a slight mark against it is a bit of weak painting on the coat trim, with some of the gold paint overlapping the lines. This however is only really noticeable on very close inspection and does not detract at all from the overall look of the figure. 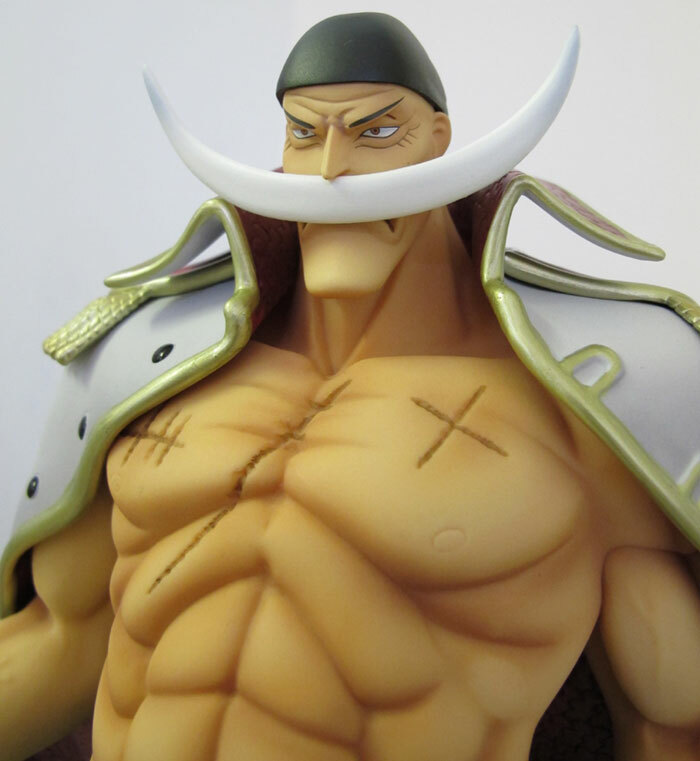 Whilst this One Piece Portrait of Pirates Neo figure is the most expensive one to date (only rivalled by the Bartholomew Kuma figure) it is also the most impressive, biggest and most imposing of the lot. Even though he is not in scale with the other figures he still dwarfs them - to give you a sense of his size I took this picture of him standing side by side with the Portgaz D Ace figure from the same range. Sculpt-wise he is probably the best Portrait of Pirates figure so far, which is high praise indeed considering some of the ones that have gone before, and apart from a some barely noticeable errors the painting is hugely impressive too. The £100 price tag may put many off and it's unlikely that Neon Martian or any other UK retailer will get many in (it's already long sold out in Japan), but trust me when I say that it's worth every penny. Many £200+ statues aren't as big or detailed as this figure, and its sheer impact makes him a perfect centrepiece for any figure collection. 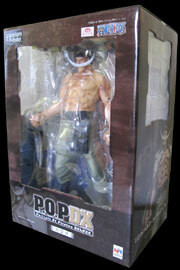 This figure is lighter on the extras front than many of the other Portrait of Pirates figures. Aside from the usual base, which is a more elongated shape than normal to account for his huge size, he comes with a coat that can be rested on his shoulders and his massive halberd. The halberd has two heads, one normal and one with slight battle damage in the form of chips and cuts on the blade. 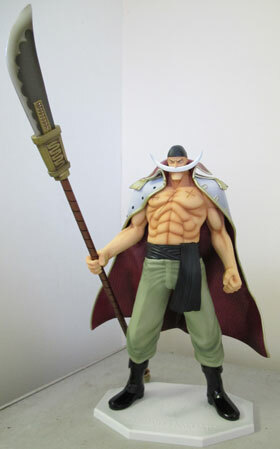 It's also worth noting that the figure has a tattoo of Whitebeard's emblem on his back, which the coat covers but is nice to see included. Considering the size of the figure it's good to see any kind of extras included, and the additional halberd head is an unexpected bonus.